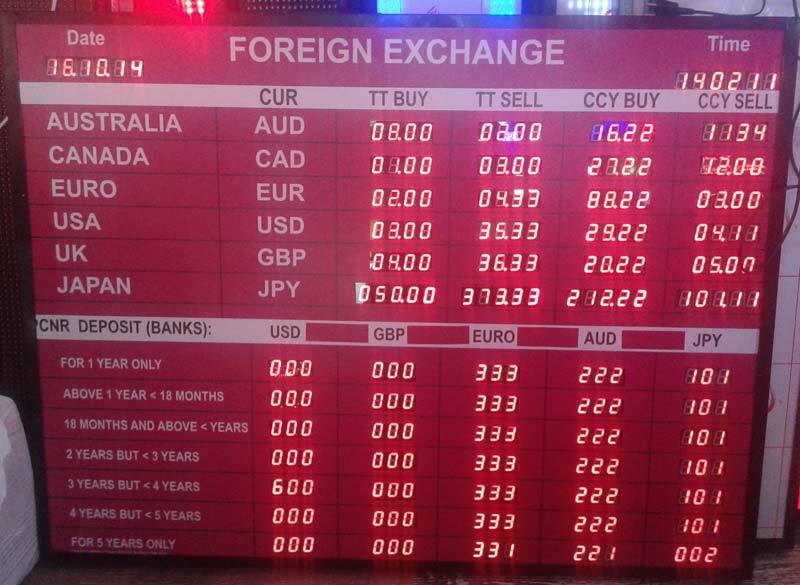 Another variety that we bring to our nationwide buyers is Foreign Exchange Rate LED Display Boards! We are renowned Manufacturer & Supplier of Foreign Exchange Rate LED Display Boards based in Delhi, India. We keep a lot at our spacious warehouse to entertain voluminous orders at a time. One can rely on us for timely deliveries. Four & Six Digit Display. Available in Numeric Displays or in Matrix Mode. DATE/ TIME Display is available (OPTIONAL). Gang able - Multiple Displays can show the same Data. High Quality MS Powder Coated Casing. Require Power Input 220 V +/- 10 %, 50 Hz. No. of Display Window can be Customized as per the Customer Requirements. For Corporate Banks, Currency Exchange Counters. Indoor Displays with High Readability. Display Boards are available with currency exchange rates, traveler’s check rates (buy and sell) for any number of countries. Multi color, running and moving display with real time date and time display are among the features. Display Systems (LED Display) are built to custom specifications.